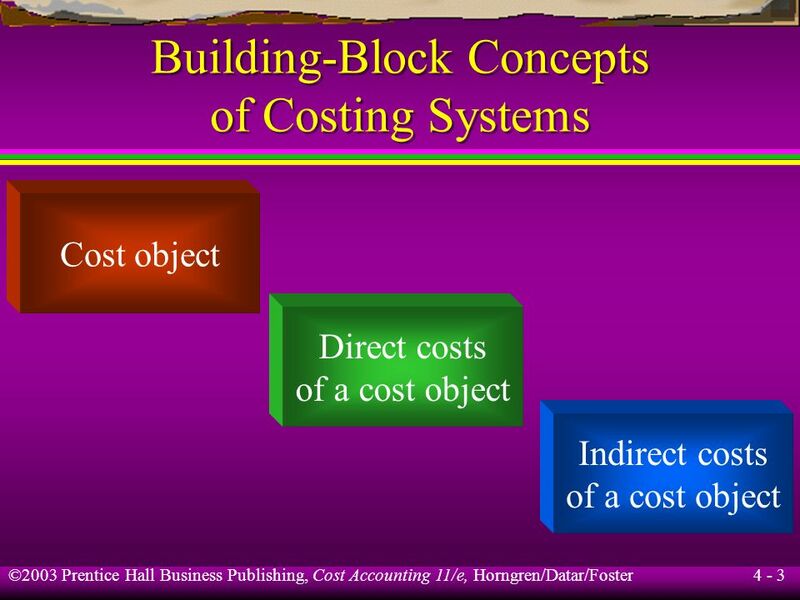 2 Describe the building-block concepts of costing systems. 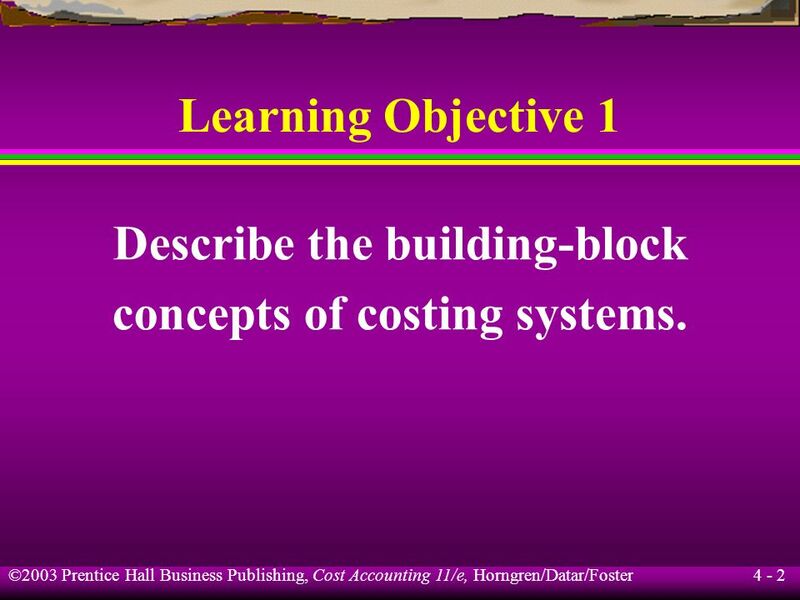 Learning Objective 1 Describe the building-block concepts of costing systems. 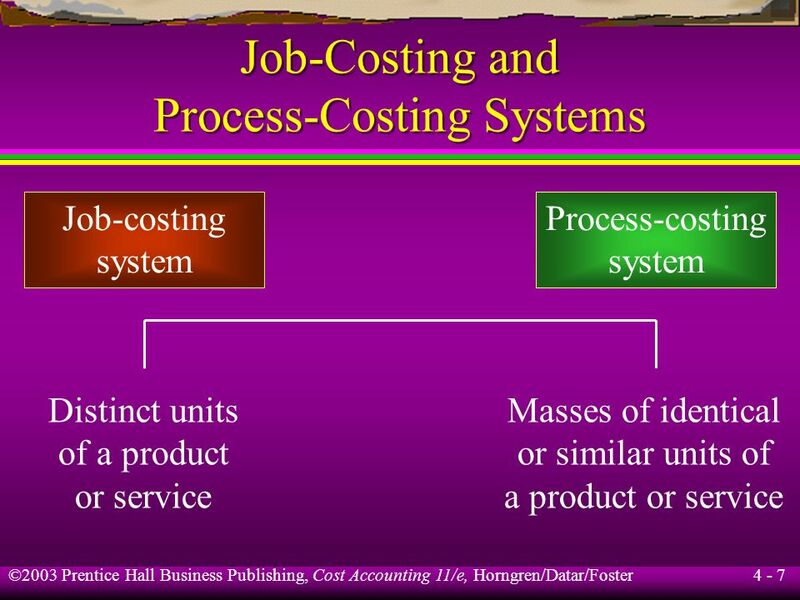 6 Distinguish between job costing and process costing. 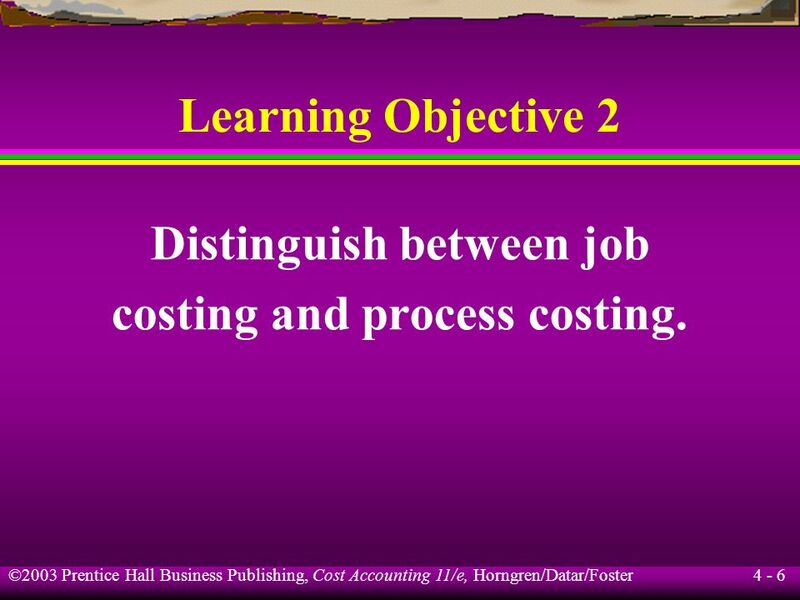 Learning Objective 2 Distinguish between job costing and process costing. 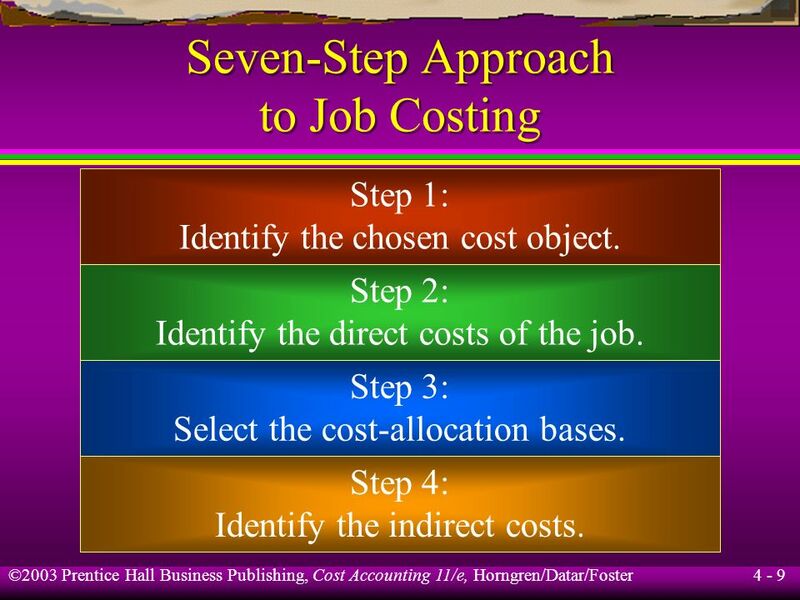 8 approach to job costing. 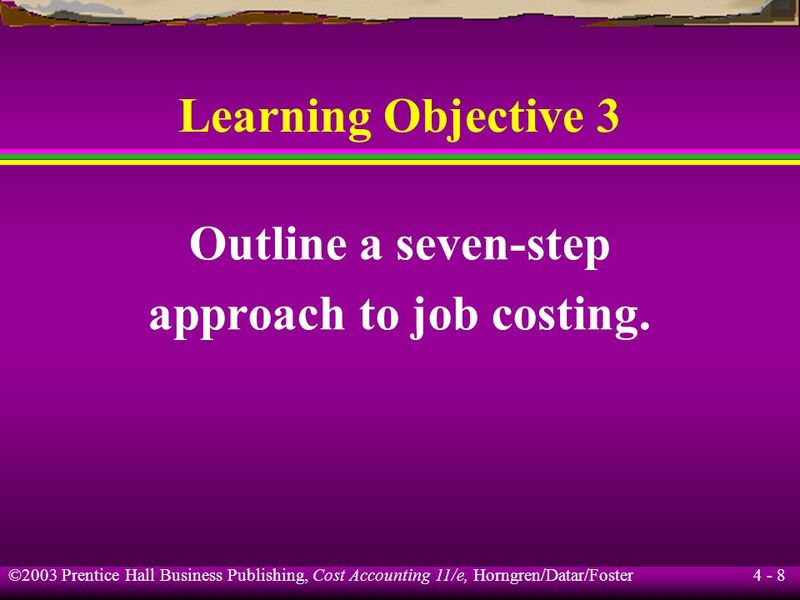 Learning Objective 3 Outline a seven-step approach to job costing. 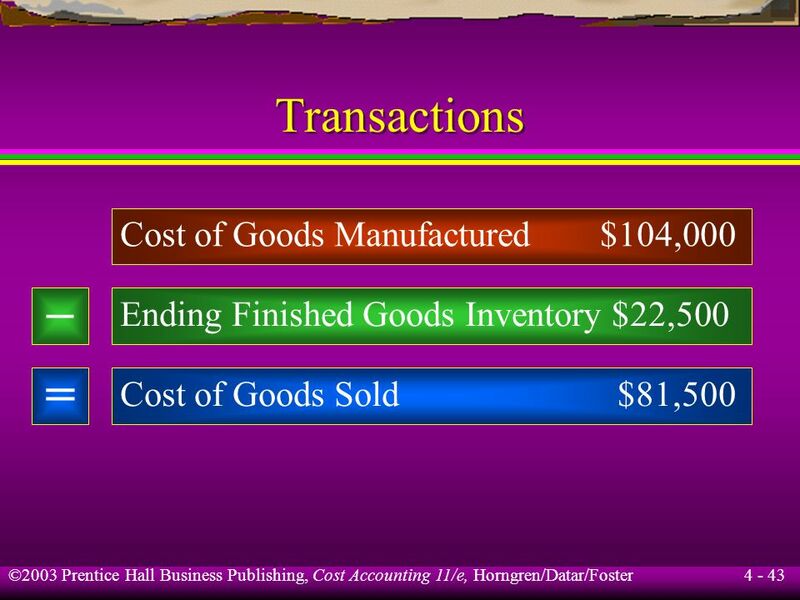 Identify the chosen cost object. 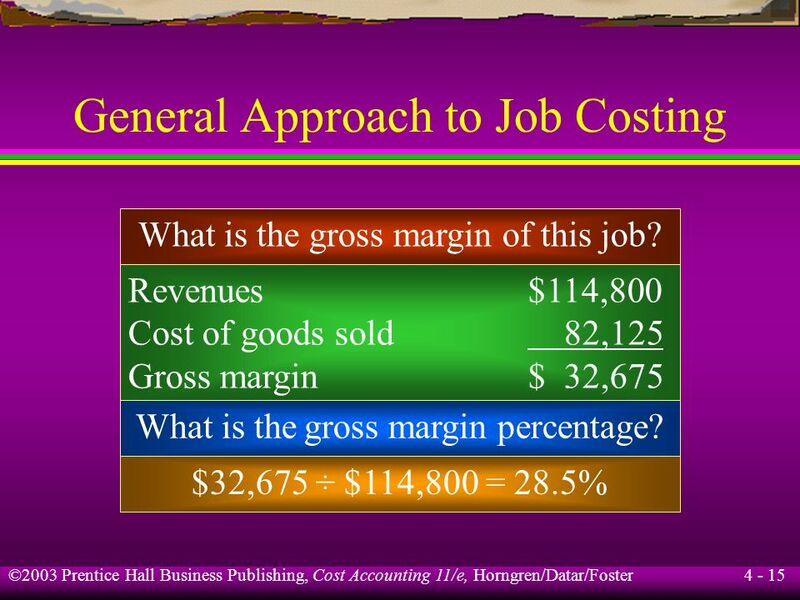 Step 2: Identify the direct costs of the job. 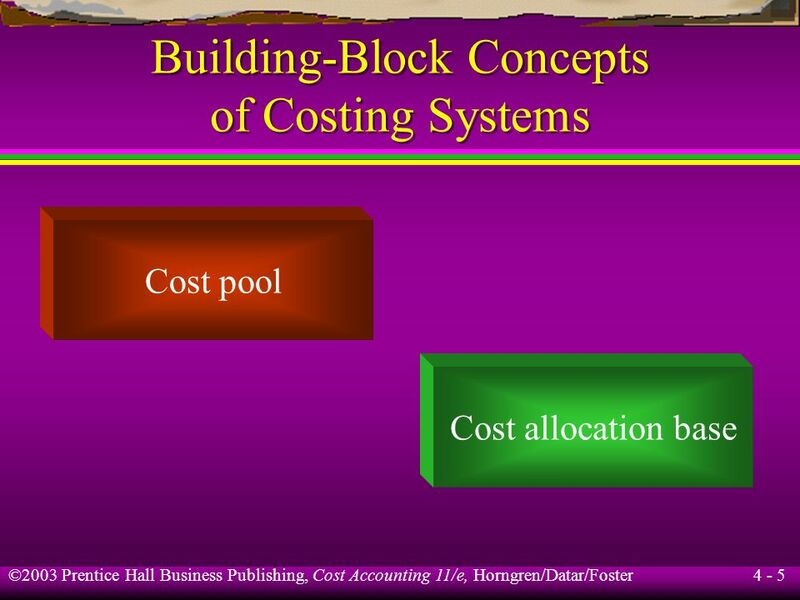 Step 3: Select the cost-allocation bases. 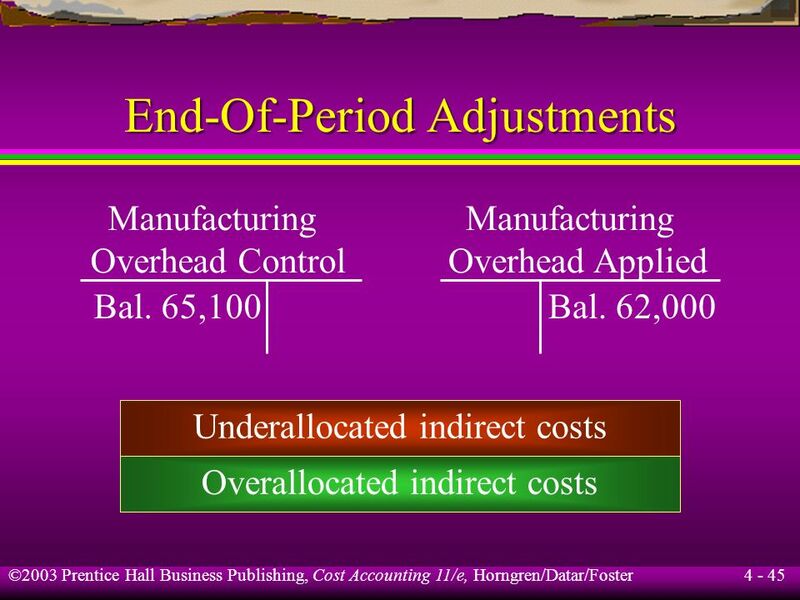 Step 4: Identify the indirect costs. 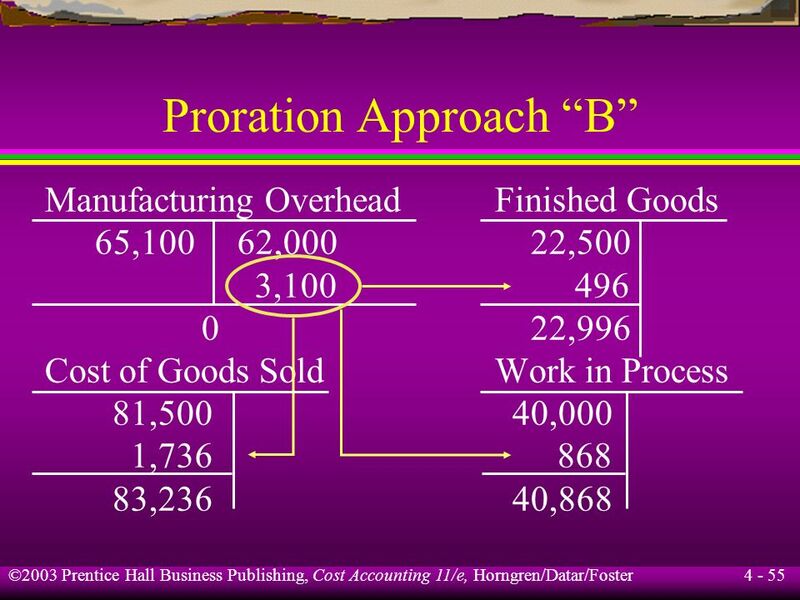 Compute the rate per unit. 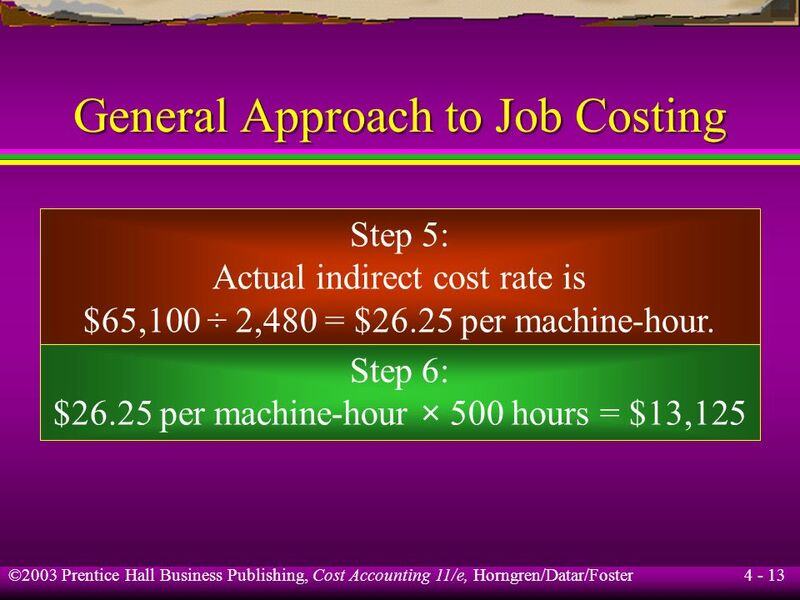 Step 6: Compute the indirect costs. 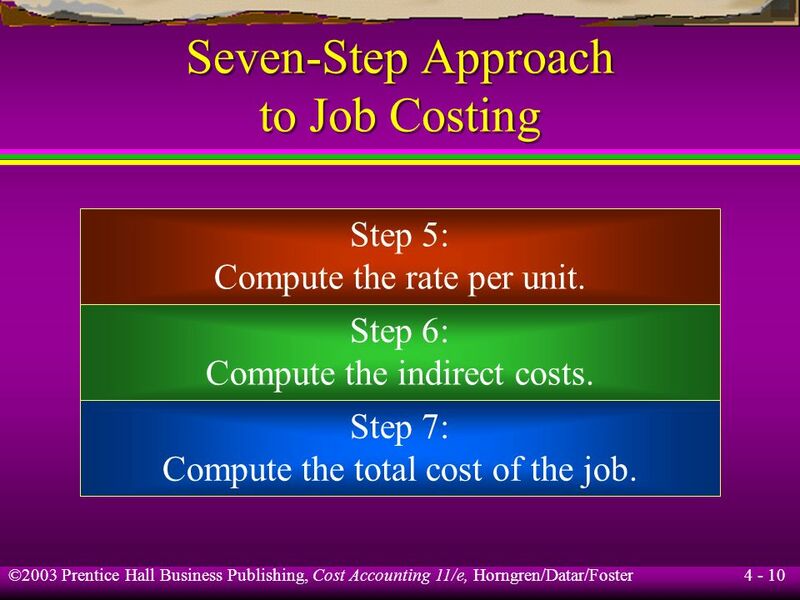 Step 7: Compute the total cost of the job. 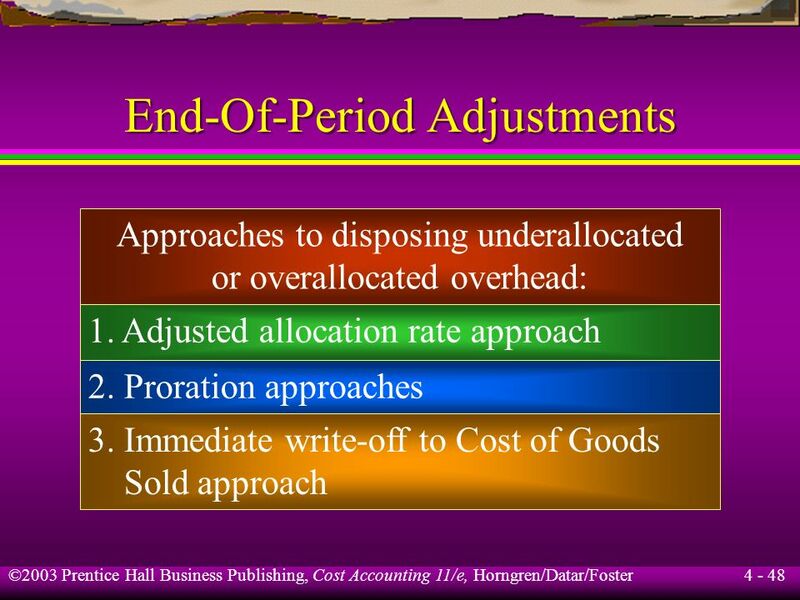 Step 3: The cost allocation base is machine-hours. 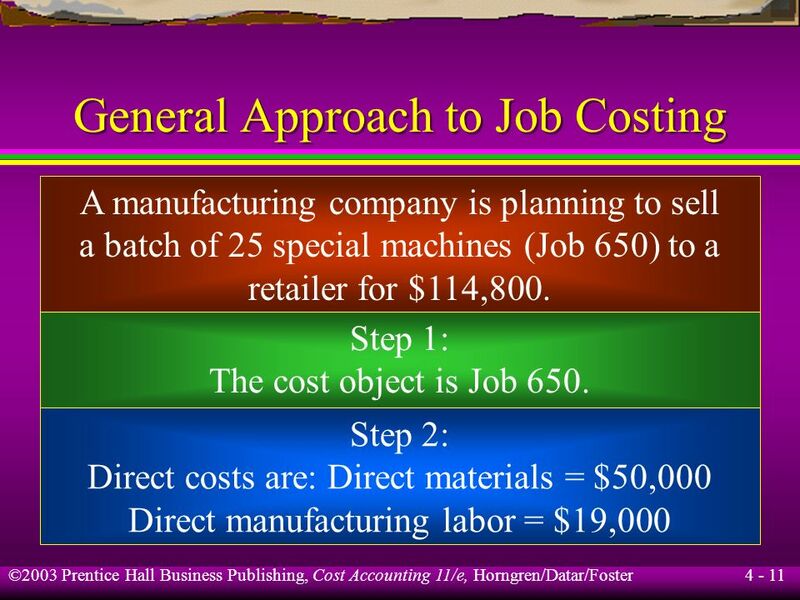 Job 650 used 500 machine-hours. 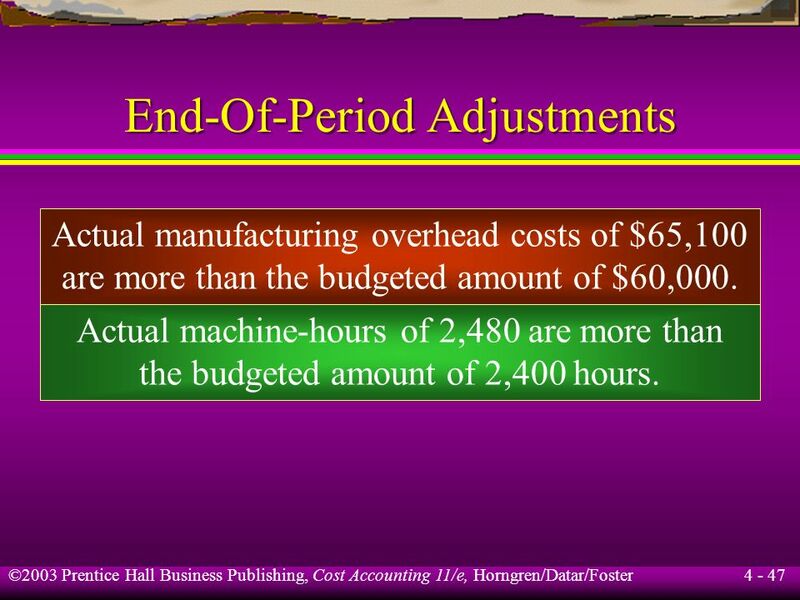 2,480 machine-hours were used by all jobs. 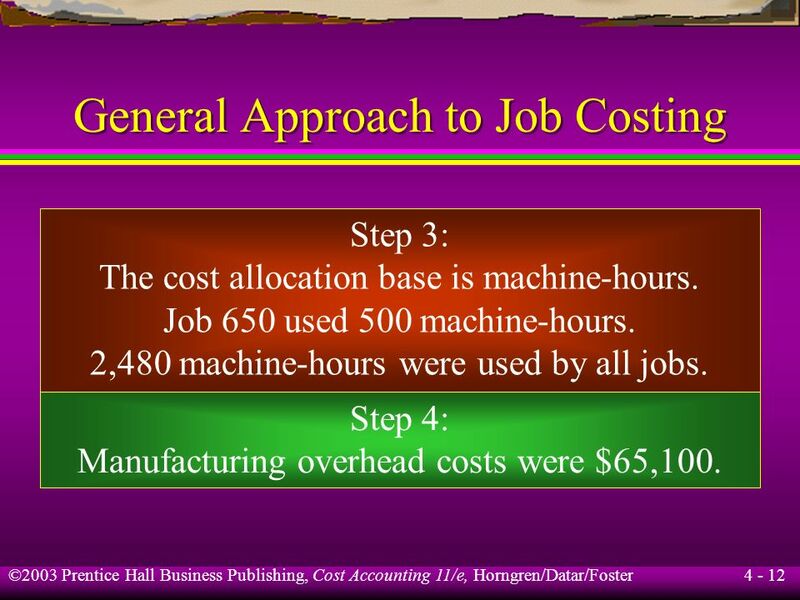 Step 4: Manufacturing overhead costs were $65,100. 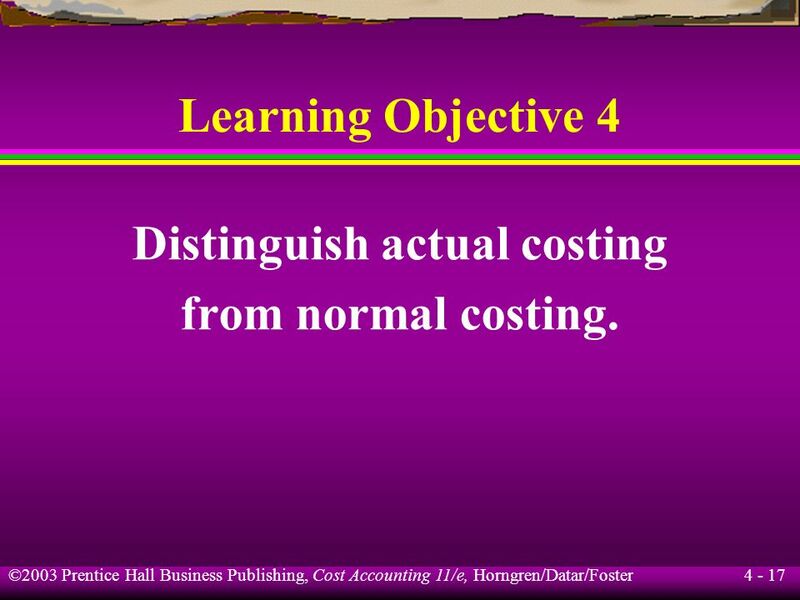 Learning Objective 4 Distinguish actual costing from normal costing. 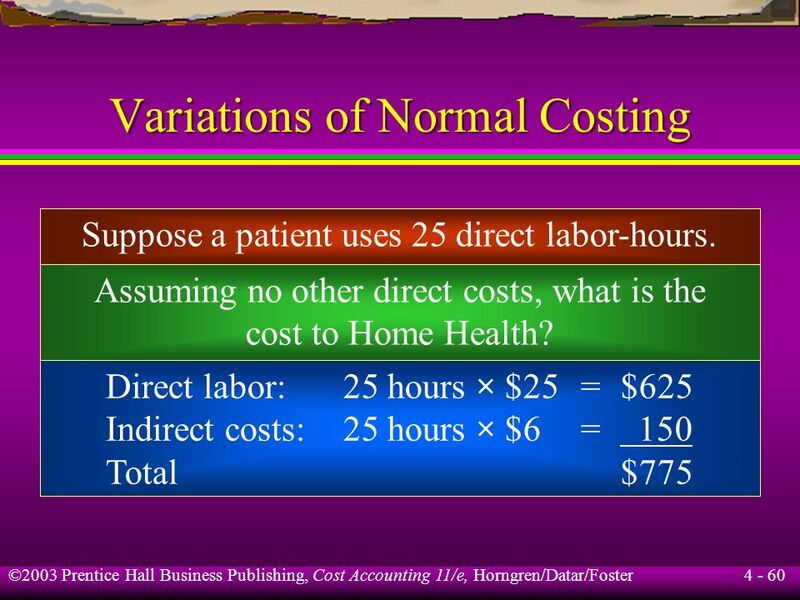 costs to determine the cost of individual jobs. 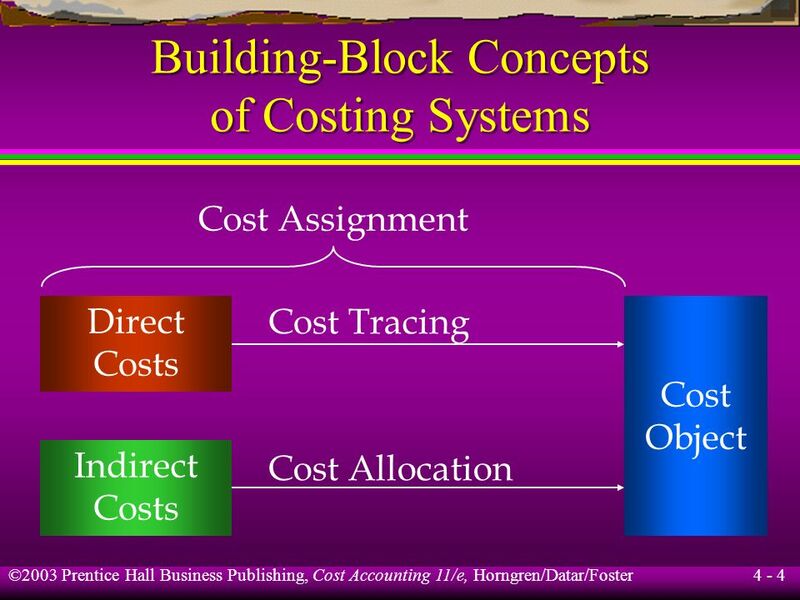 It allocates indirect costs based on the actual indirect-cost rate(s) times the actual quantity of the cost-allocation base(s). 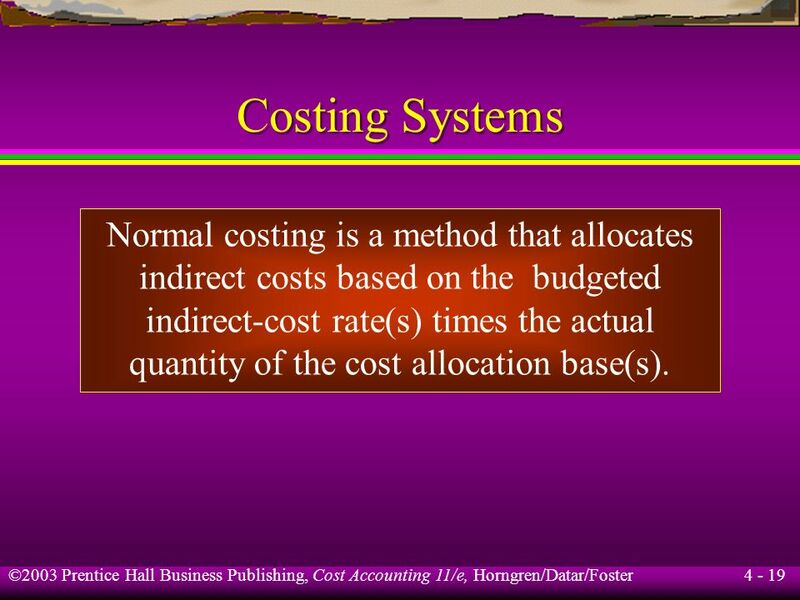 indirect costs based on the budgeted indirect-cost rate(s) times the actual quantity of the cost allocation base(s). 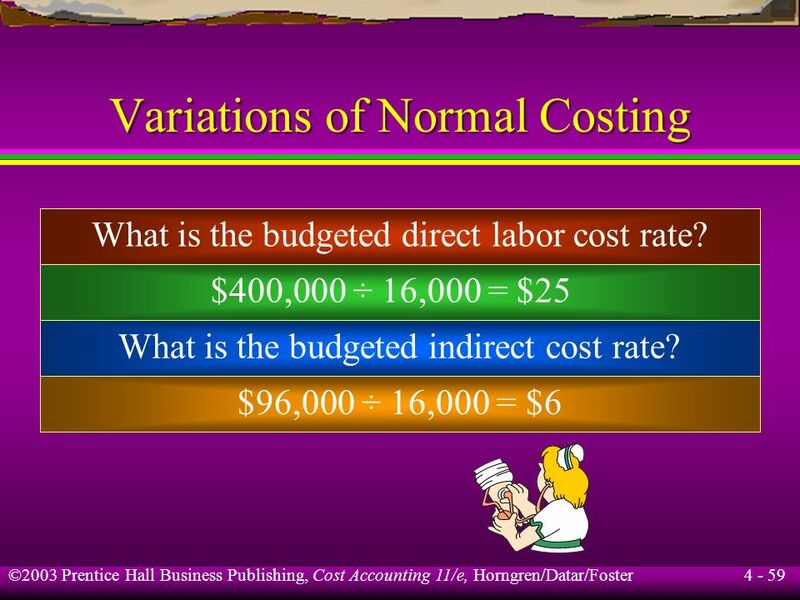 21 What is the cost of Job 650 under normal costing? 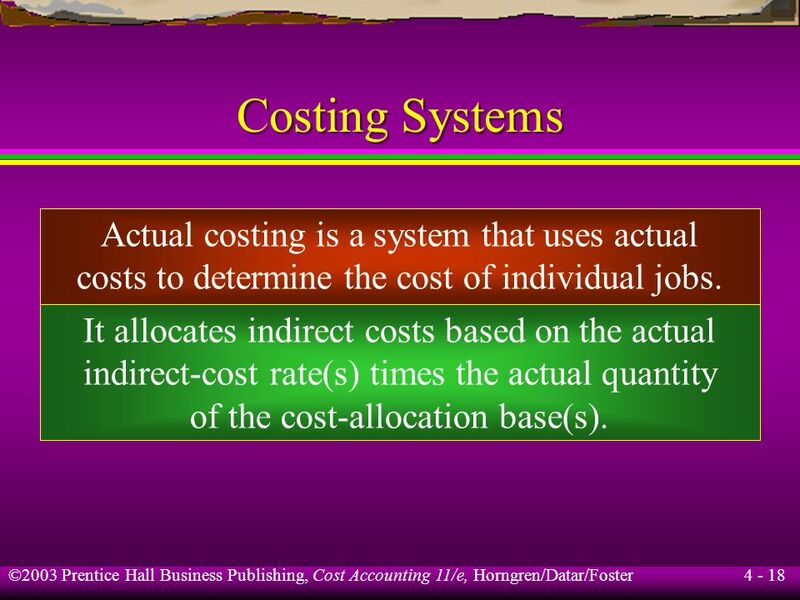 22 in a job-costing system. 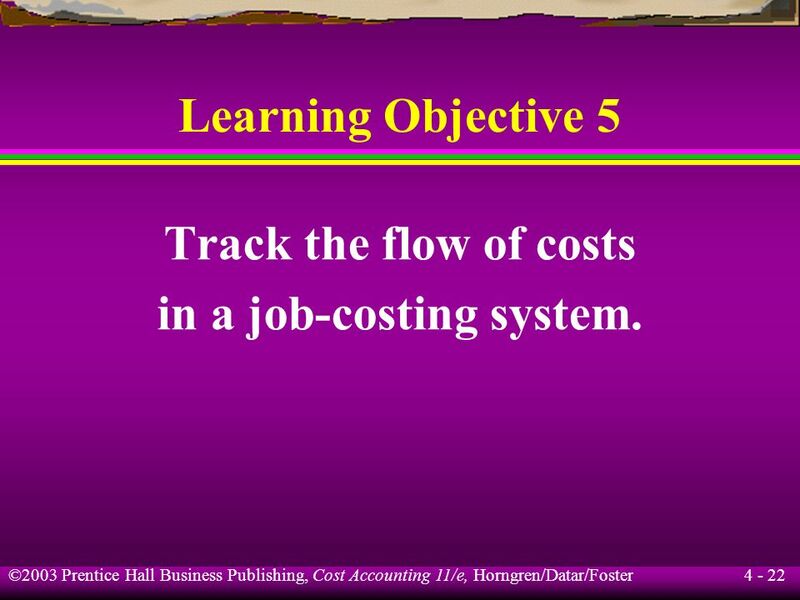 Learning Objective 5 Track the flow of costs in a job-costing system. manufacturing plant floor. 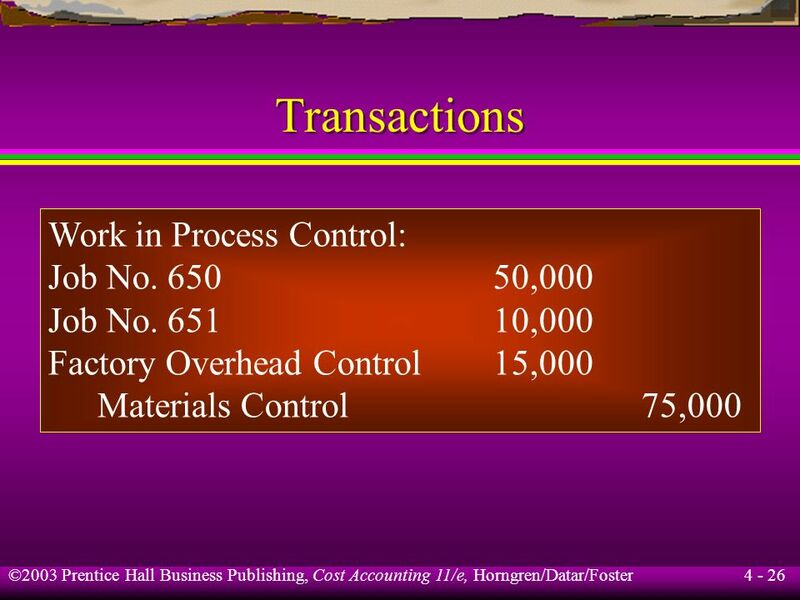 $50,000 were issued to Job No. 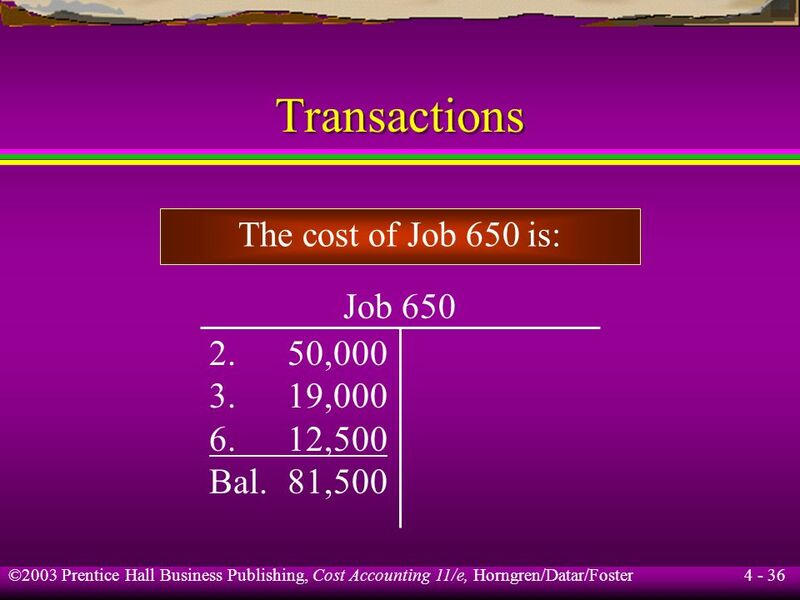 650 and $10,000 to Job 651. 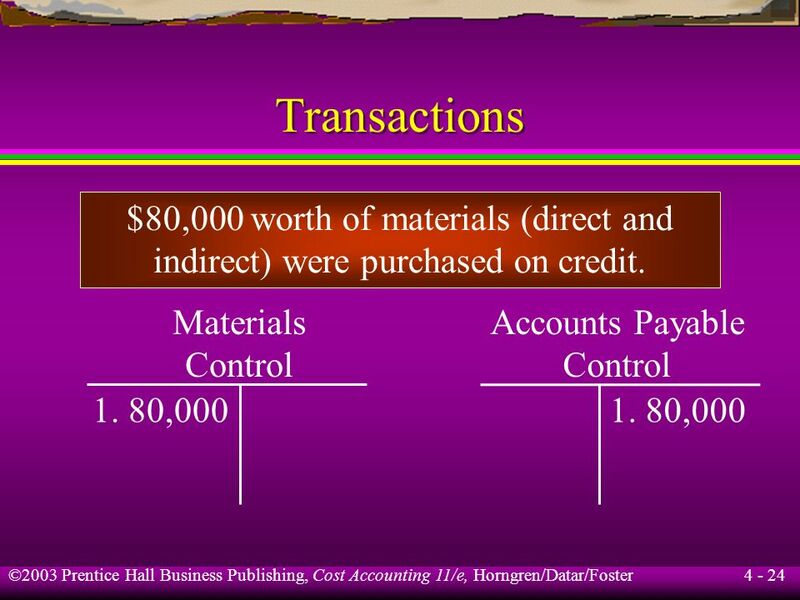 $15,000 of indirect materials were issued. 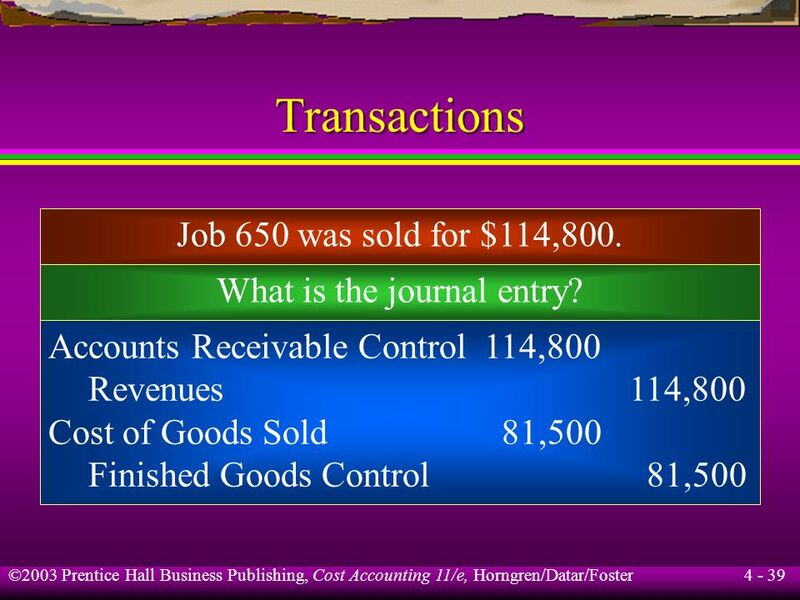 What is the journal entry? 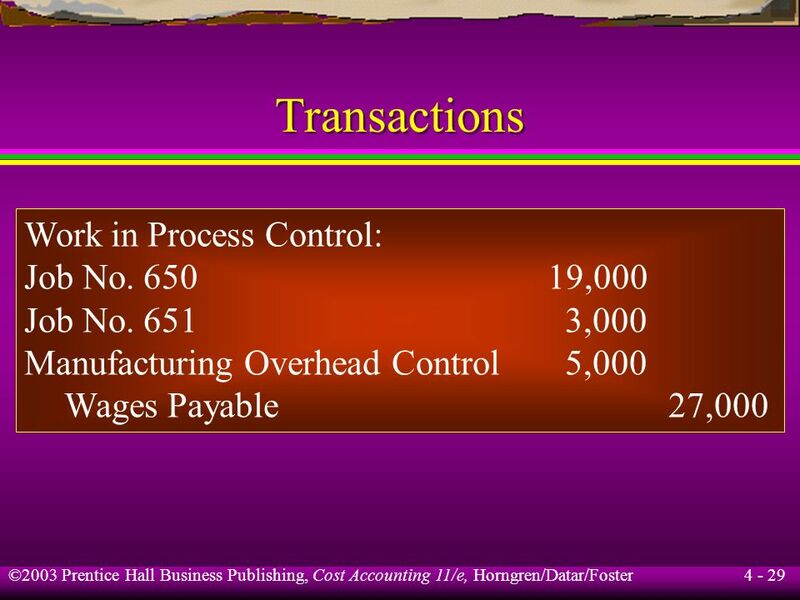 28 Transactions Total manufacturing payroll for the period was $27,000. 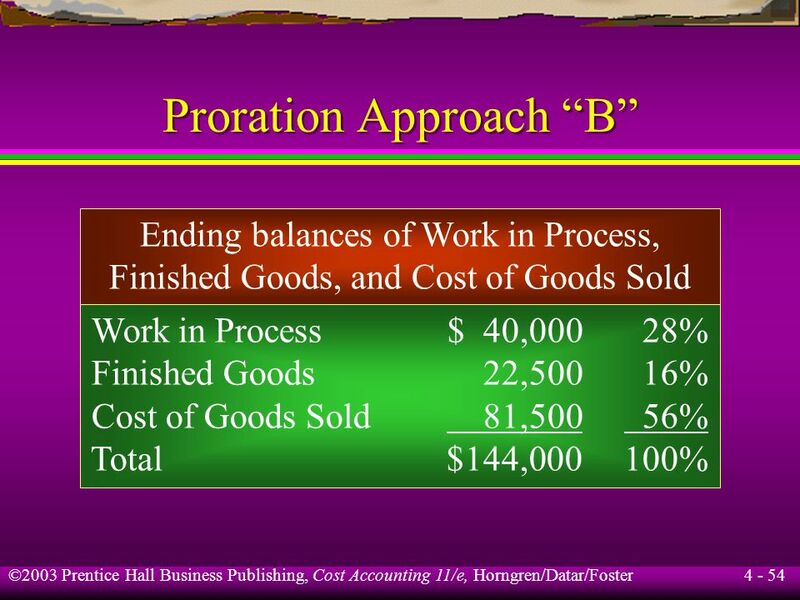 Job No. 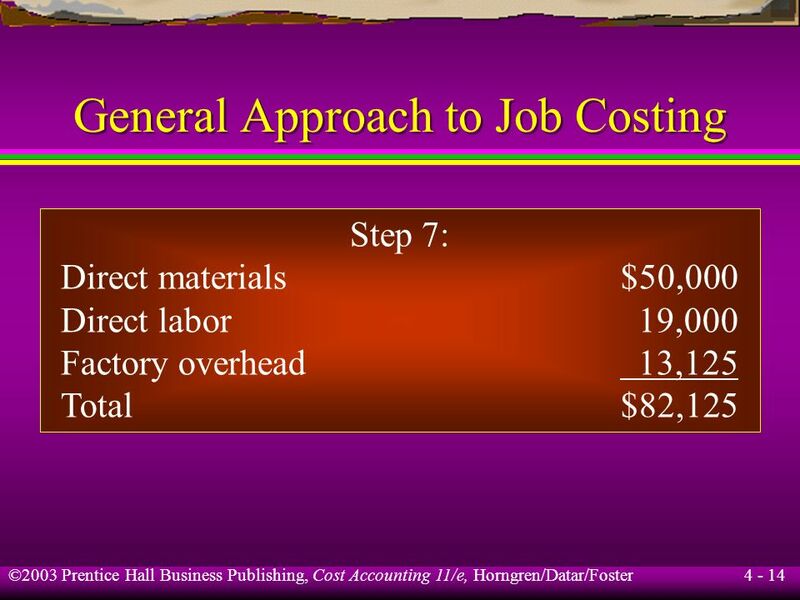 650 incurred direct labor costs of $19,000 and Job No. 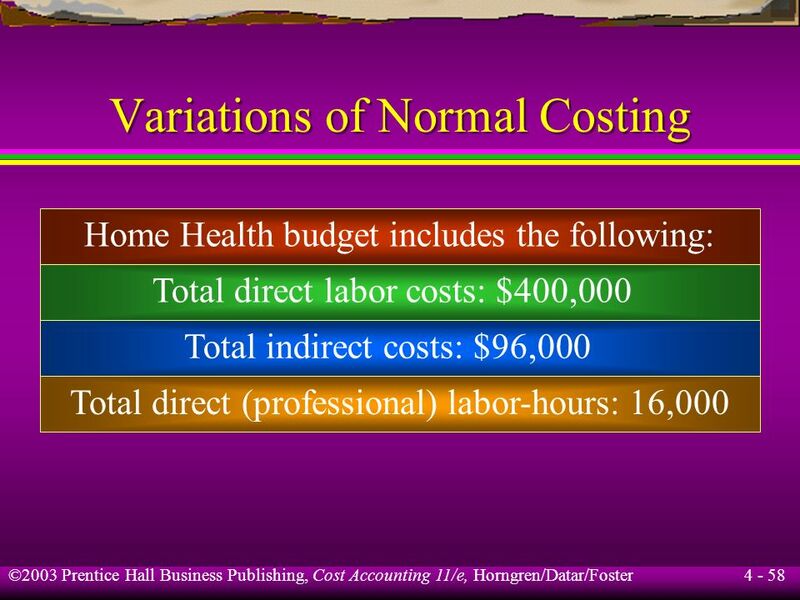 651 incurred direct labor costs of $3,000. 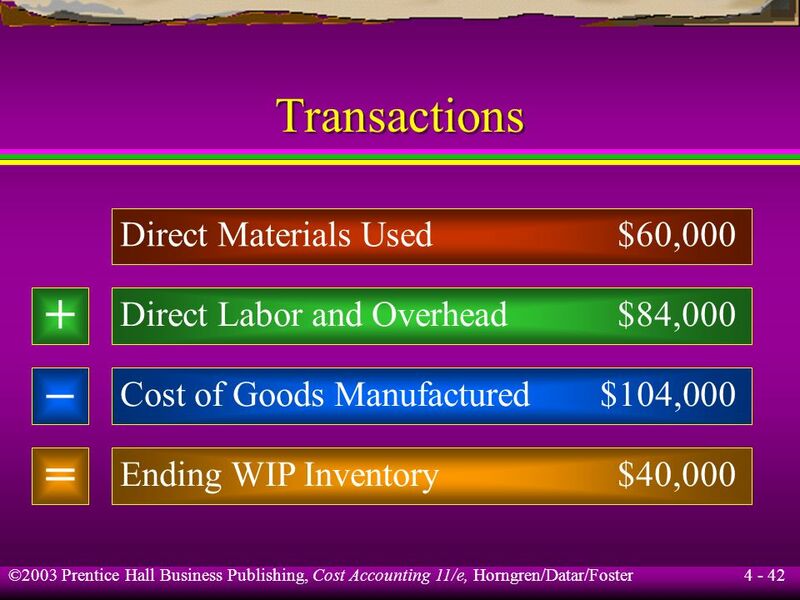 $5,000 of indirect labor was also incurred. 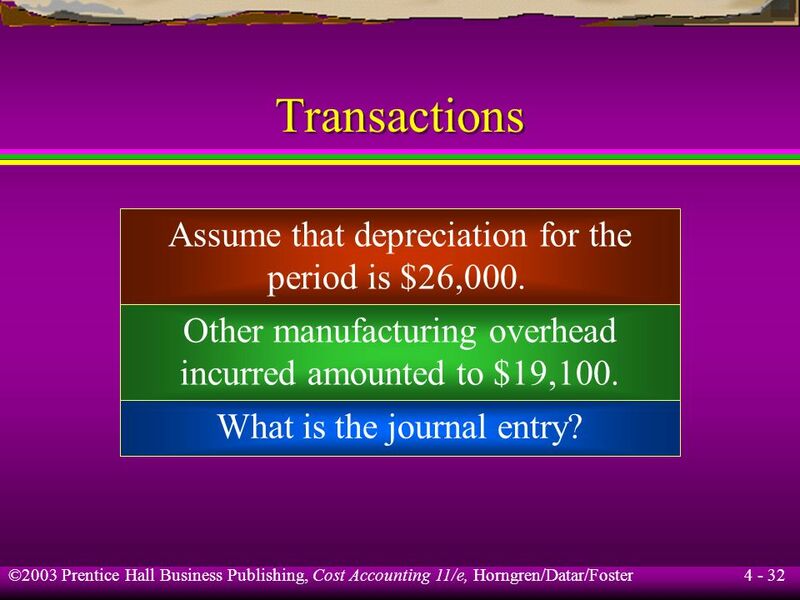 What is the journal entry? 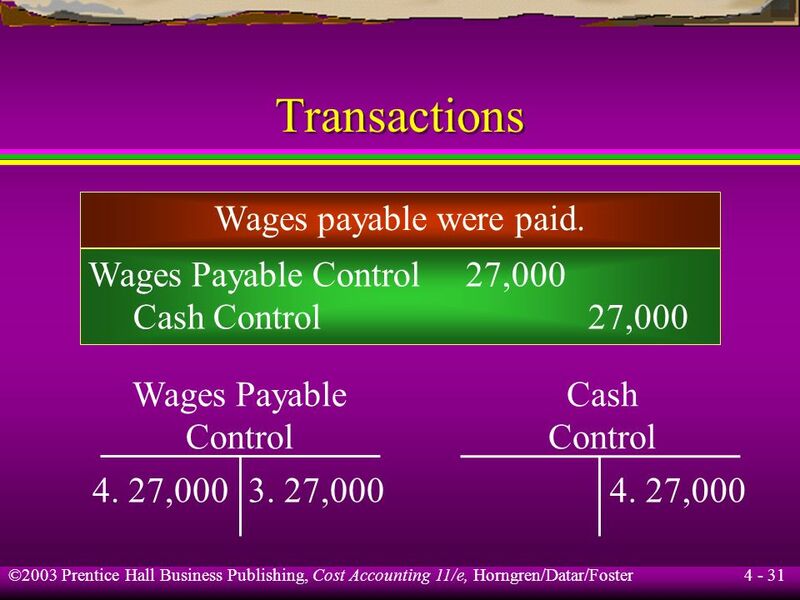 31 Wages payable were paid. 32 Transactions Assume that depreciation for the period is $26,000. 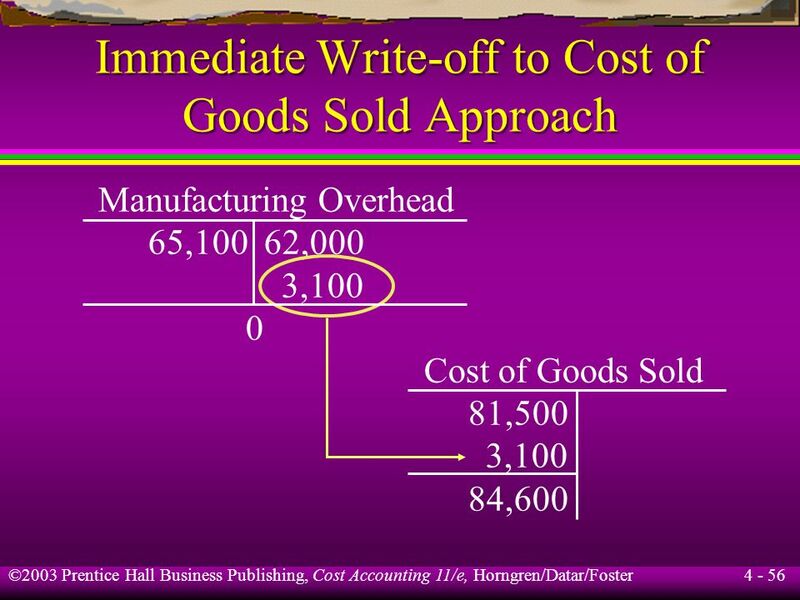 Other manufacturing overhead incurred amounted to $19,100. 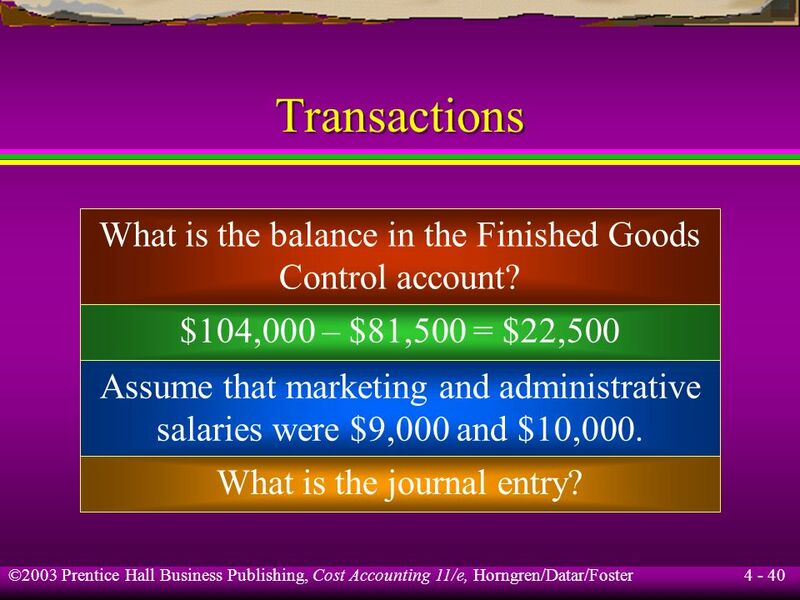 What is the journal entry? 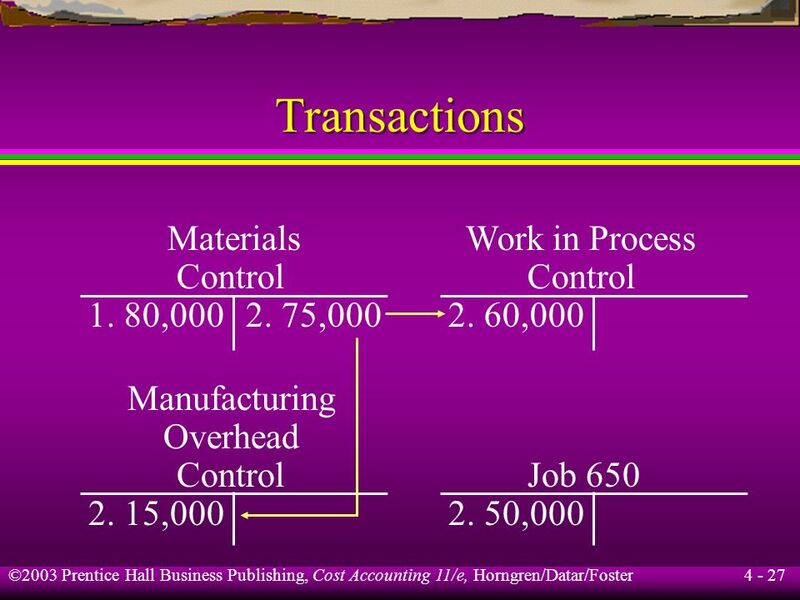 Accumulated Depreciation Control ,000 Various Accounts ,100 What is the balance of the Manufacturing Overhead Control account? 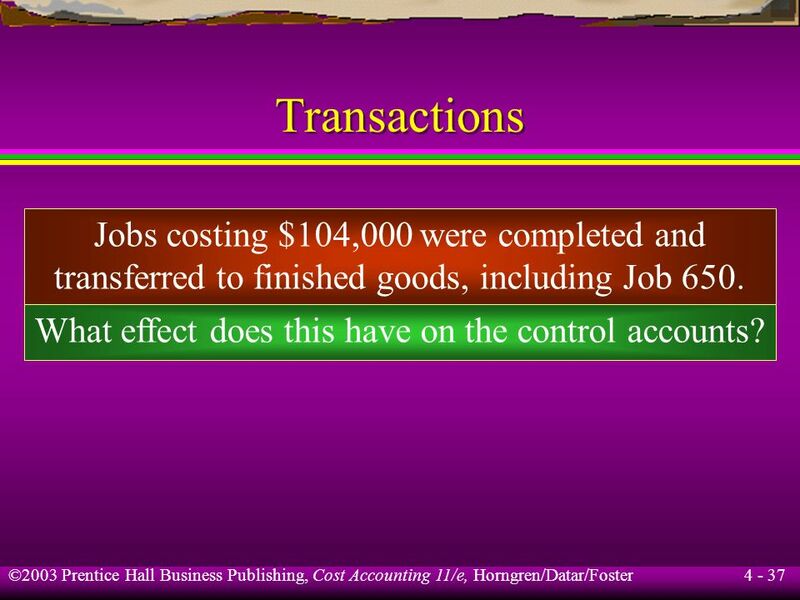 various jobs of which $12,500 went to Job 650. 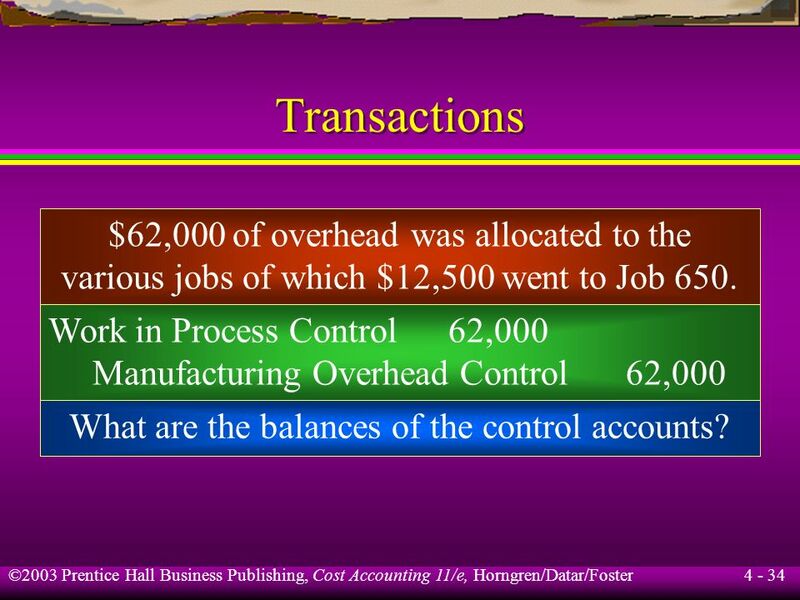 Work in Process Control	62,000 Manufacturing Overhead Control	62,000 What are the balances of the control accounts? 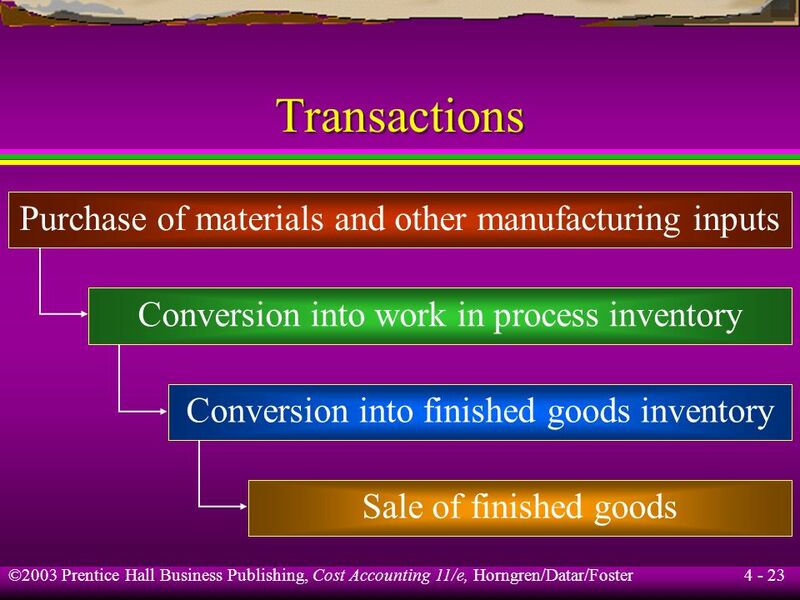 transferred to finished goods, including Job 650. 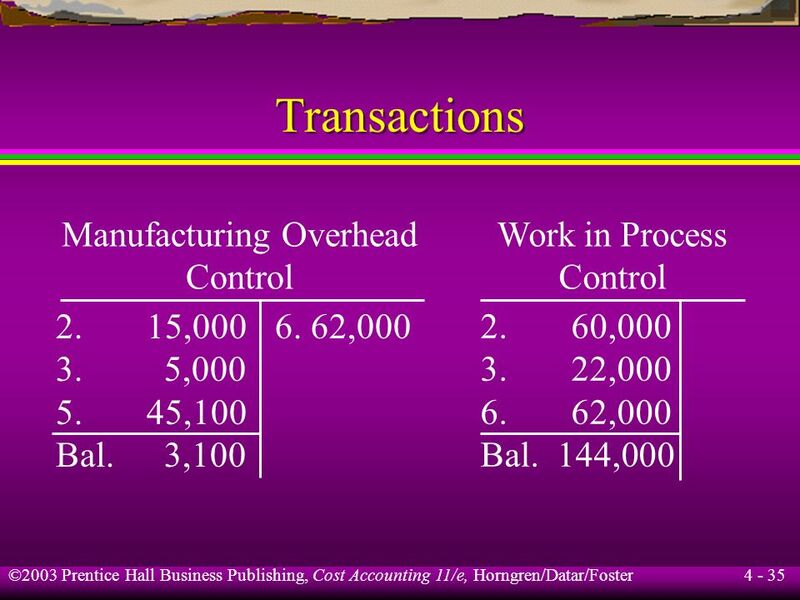 What effect does this have on the control accounts? 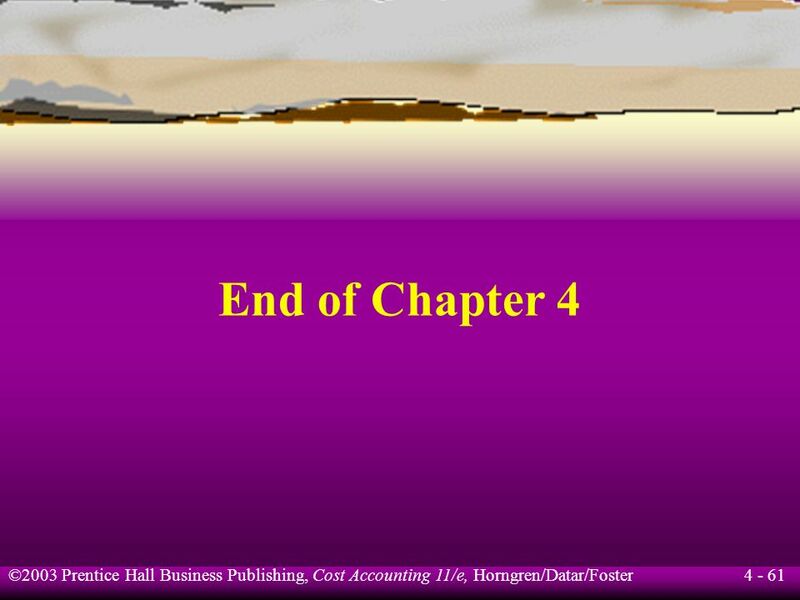 39 What is the journal entry? 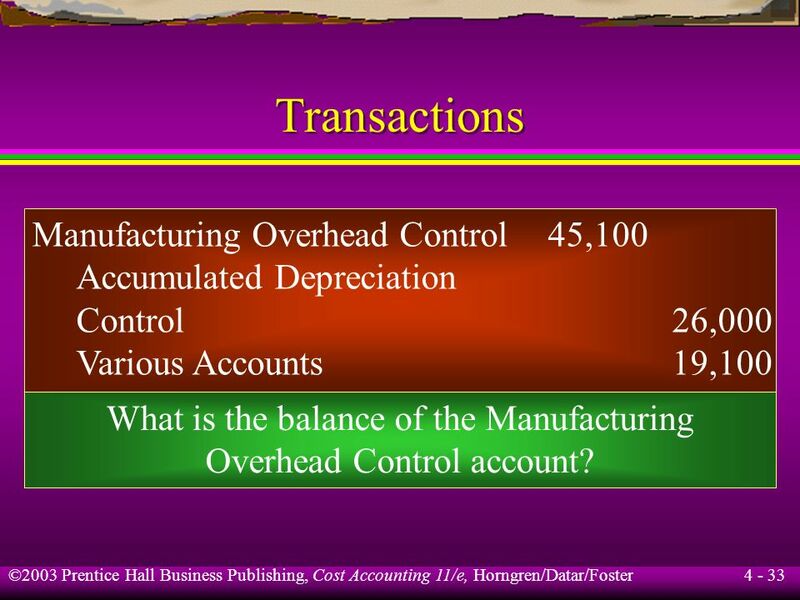 Control account? 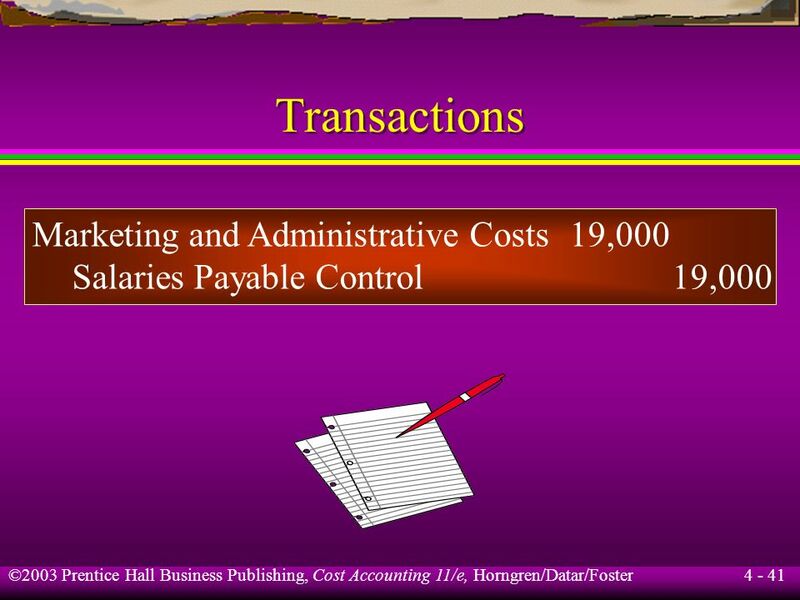 $104,000 – $81,500 = $22,500 Assume that marketing and administrative salaries were $9,000 and $10,000. 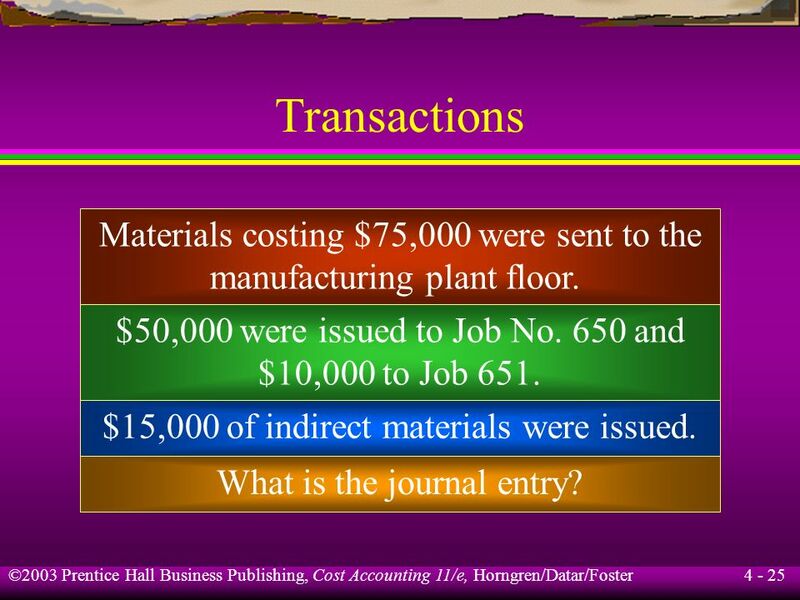 What is the journal entry? 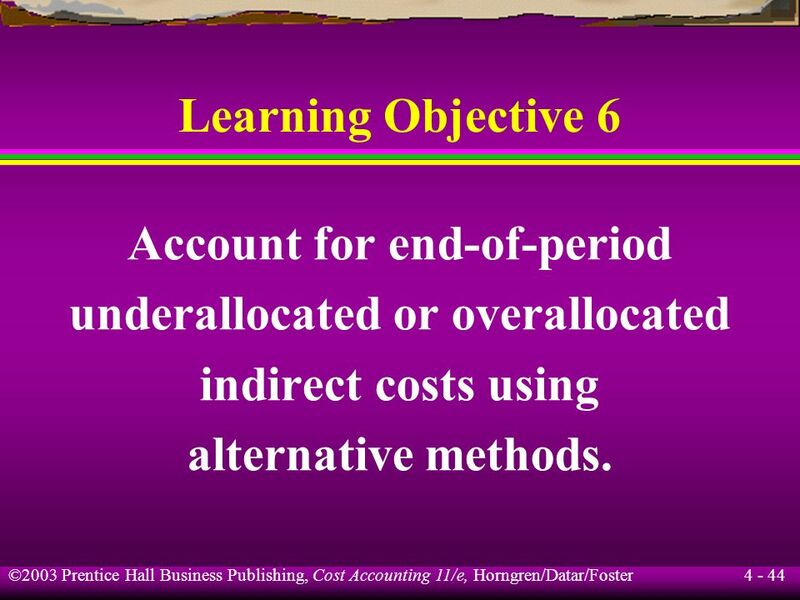 Learning Objective 6 Account for end-of-period underallocated or overallocated indirect costs using alternative methods. 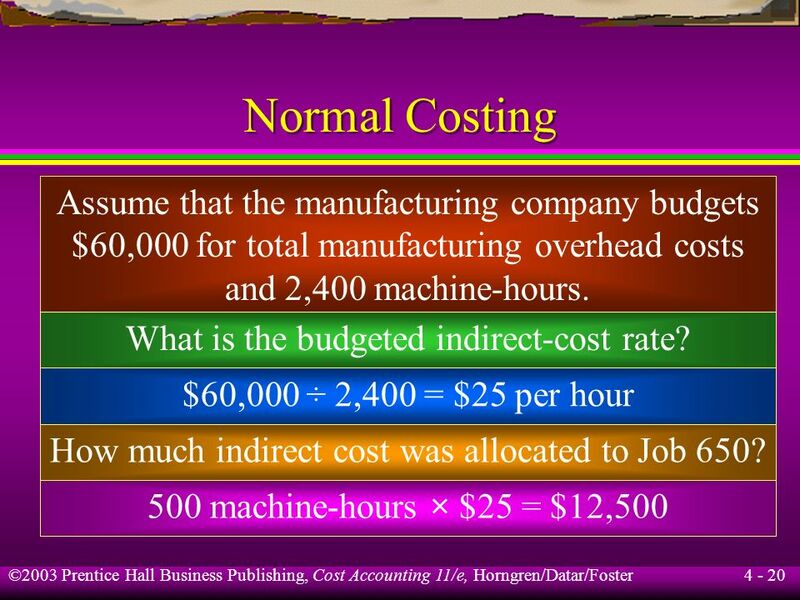 Actual manufacturing overhead costs of $65,100 are more than the budgeted amount of $60,000. 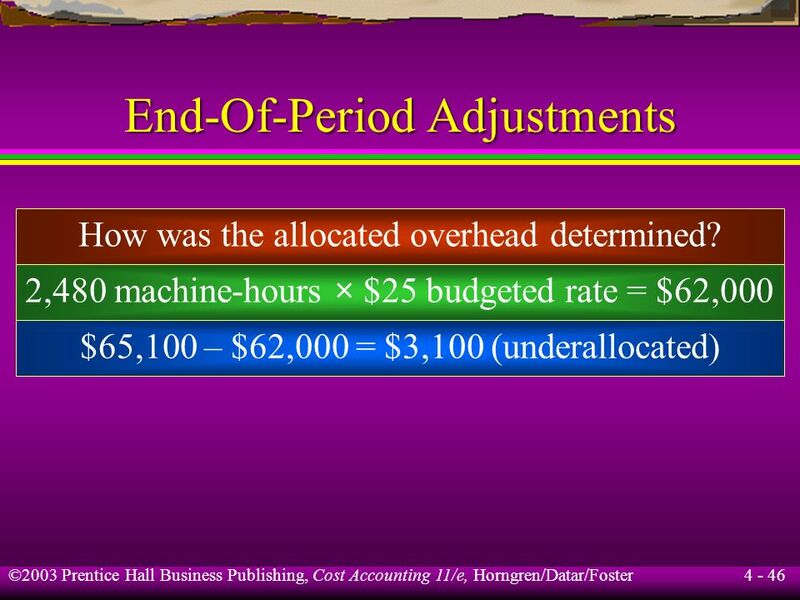 Actual machine-hours of 2,480 are more than the budgeted amount of 2,400 hours. 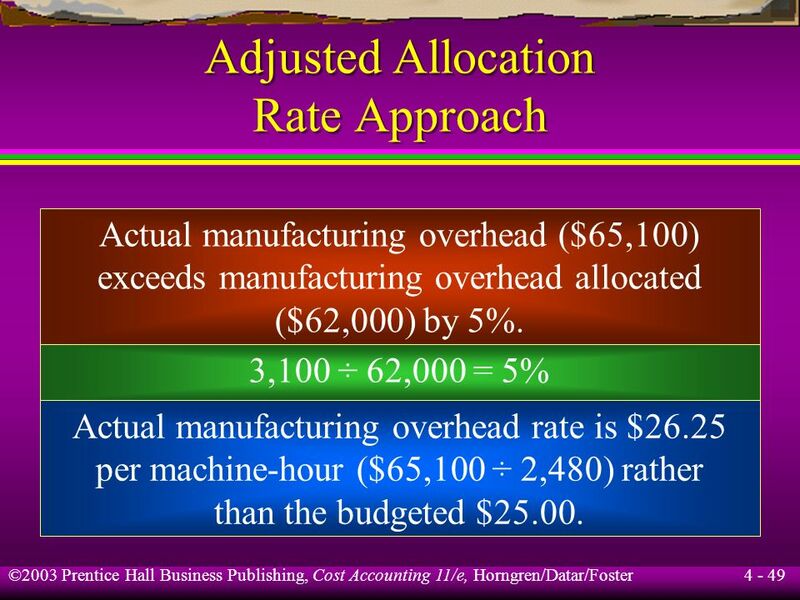 Actual manufacturing overhead ($65,100) exceeds manufacturing overhead allocated ($62,000) by 5%. 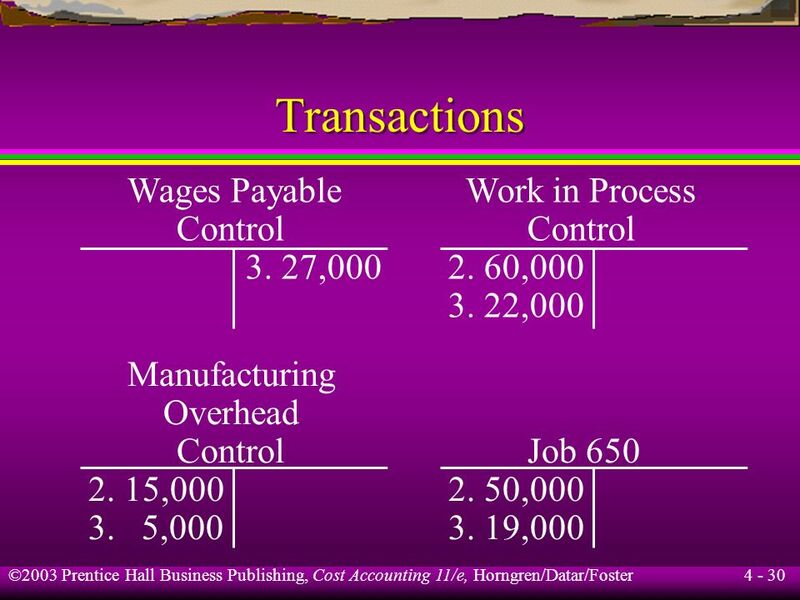 3,100 ÷ 62,000 = 5% Actual manufacturing overhead rate is $26.25 per machine-hour ($65,100 ÷ 2,480) rather than the budgeted $25.00. 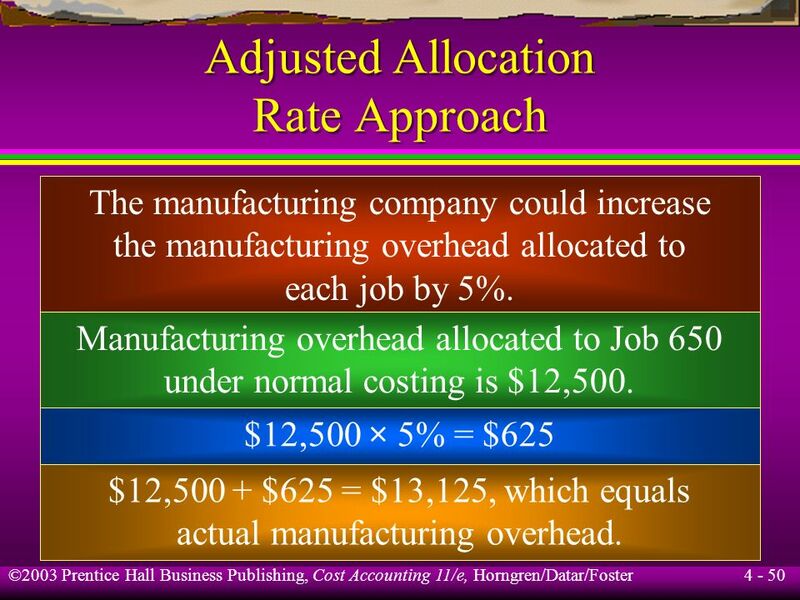 The manufacturing company could increase the manufacturing overhead allocated to each job by 5%. 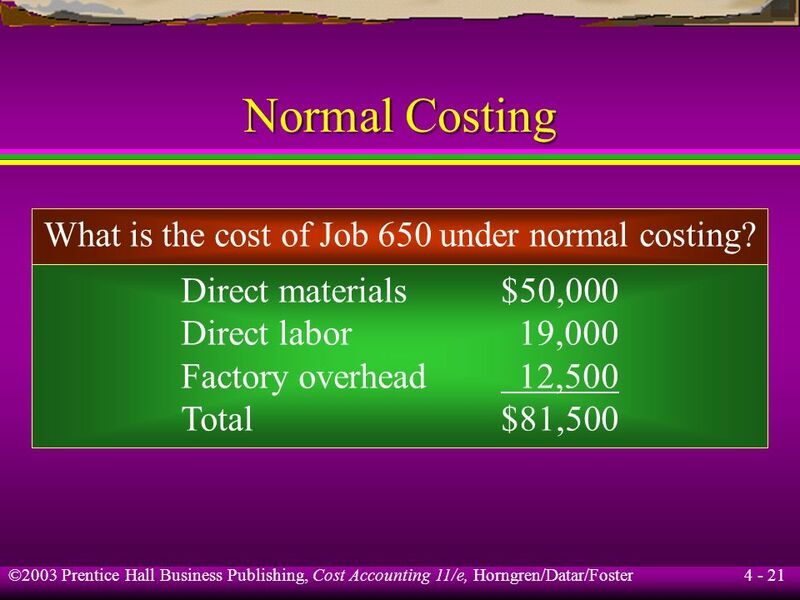 Manufacturing overhead allocated to Job 650 under normal costing is $12,500. 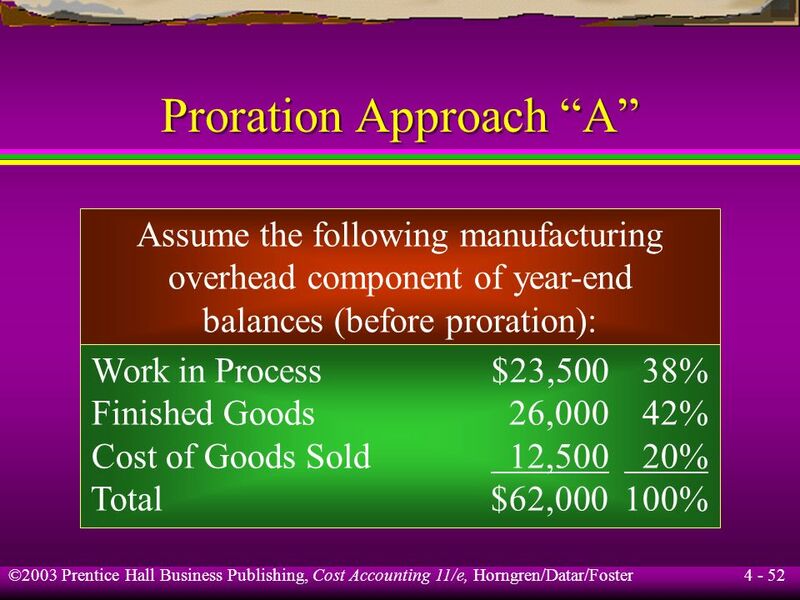 $12,500 × 5% = $625 $12,500 + $625 = $13,125, which equals actual manufacturing overhead. 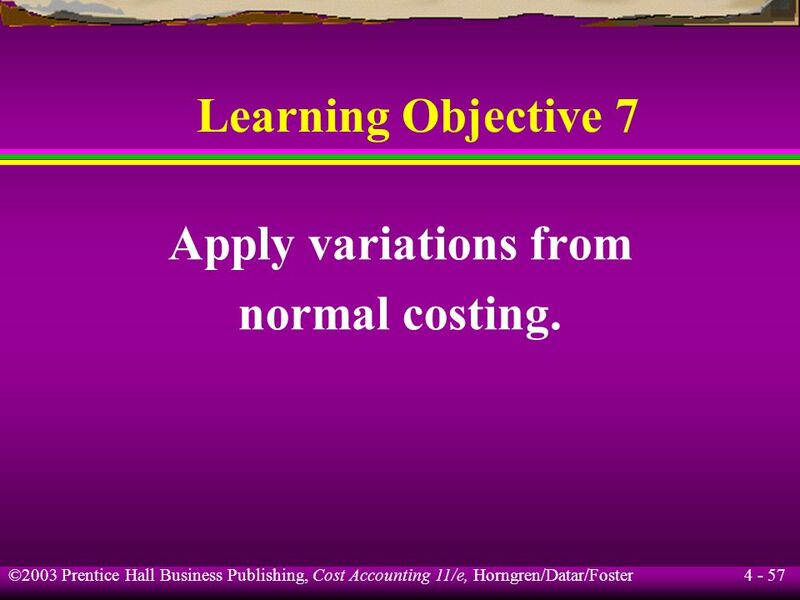 57 Learning Objective 7 Apply variations from normal costing. 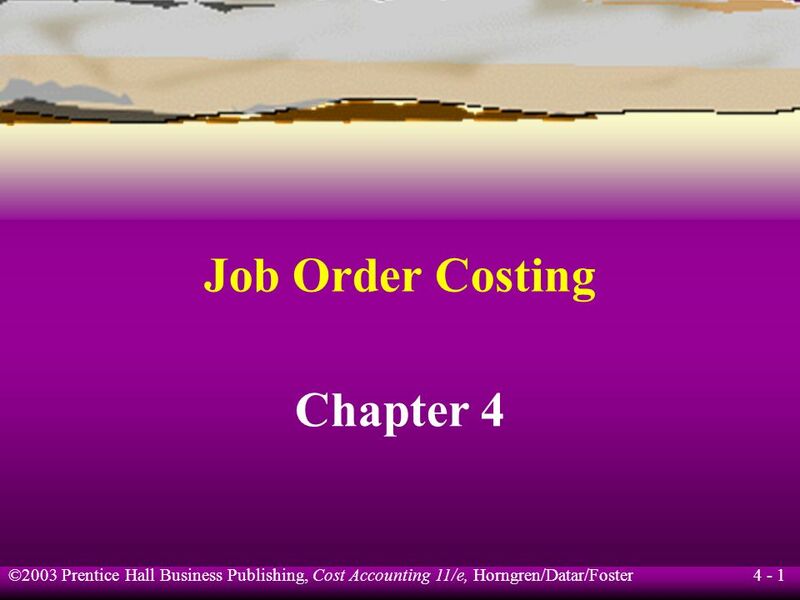 Download ppt "Job Order Costing Chapter 4." 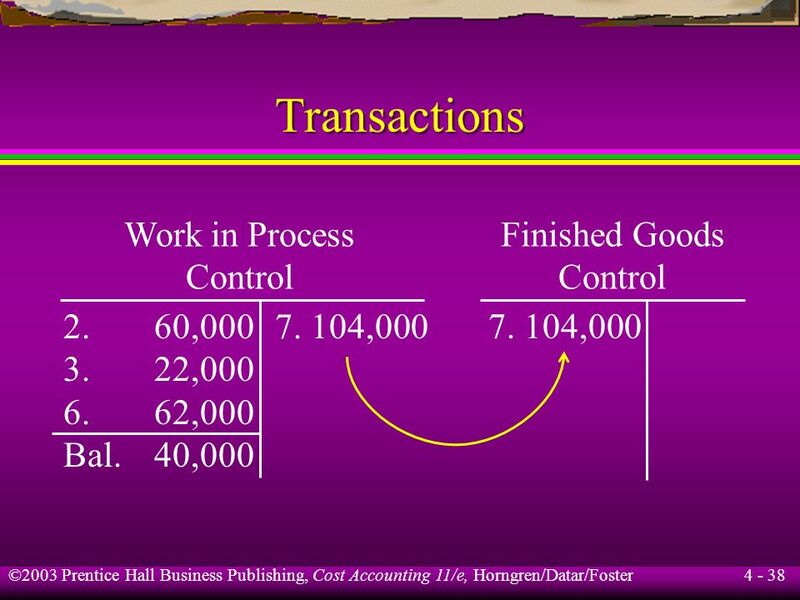 ACC 3200 Chapter 3: Process Costing Process Costing.